Last week, I forgot to take the stroller out of my car’s trunk before heading to the grocery store. The groceries wouldn’t fit in the trunk, and as I was trying to rearrange the bags and bottles while juggling Baby Hippie on my hip, my mind started to race: we really need a bigger car, we have to stop procrastinating and make this happen, the baby is going to get a sunburn out here, I can’t put him in the car because it’s too hot, I wonder how quickly milk spoils when it’s in the nineties outside, Little Hippie isn’t able to get the seatbelt untwisted and she needs my help, the frozen food is melting, GRRRR! The “Grrr!” part was out loud, and Baby Hippie gave me a funny look, which short-circuited the whine cycle. A deep breath brought a little perspective – what a wonderful dilemma: having too much food. How lucky I am to have two healthy kids to feed, the means to buy the things we need (and a lot of the things we want), and the time to make it happen. I was reminded of a friend’s recent Facebook expressing a similar sentiment of grocery-related gratitude. This experience prompted me to finish a book I had started awhile back, “Thanks! How the New Science of Gratitude Can Make You Happier” by Robert Emmons, so I could do a quick book review. I picked up this book after a friend told me how much she was helped by starting a gratitude journal. 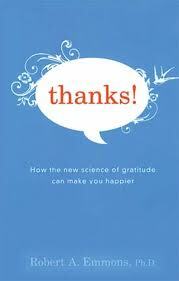 This book explains the science behind using gratitude to improve one’s quality of life. In short, it was not a blockbuster, but it had some solid information and a few great tips for cultivating a sense of gratitude in one’s daily life. Emmons spends most of the book establishing the benefits of a grateful lifestyle. Most of the connections that have been supported by research use the transitive property of mathematics: Gratitude leads to a different way of thinking; the thought patterns of that way of thinking can improve your health and happiness; therefore, gratitude leads to health and happiness. Activities that cultivate a grateful worldview have been shown to increase an individual’s sense of well-being, to improve one’s perspective on specific relationships, and to improve a relational partner’s esteem for the person practicing gratitude. The gratitude-increasing activities have also been shown to lower levels of depression. All of these things combine to create a more positive outlook, which has been shown to have lots of physical and social benefits. A positive outlook correlates to healthy cardiac rhythms, increased life span, and better sleep, to name a few. Emmons makes a pretty big leap in saying that Science proves that being grateful makes you live longer and more happily. Common sense and logic would lead me to believe that his claims are probably true, but grad school professors might take issue with the connection. Either way, though, what can it hurt to count our blessings more? The really important part of the book is the final chapter, Chapter 7: Practicing Gratitude (pp. 185-209). Emmons gives a quick overview of many of the points he made earlier in the book, then gives practical tips for training oneself to be grateful. A few of the tips sounded like b.s., but most seem genuinely helpful. Here are the ones I thought were worthy of passing along. Keep a gratitude journal – a daily, written long of things that inspire thankfulness. The items you record cannot be the same things over and over, and the things you list must be specific (don’t write “I’m grateful for my kids.” Discuss something specific that one of your kids did that made you thankful. Remember the bad: Without wallowing, recall a time of hardship in your past. It provides a means of framing current troubles by looking at a situation that was worse. This suggestion is sort of a take on the “At least I’m not . . .” You can use this to find gratitude in the fact that you are no longer in the worse situation. Use reminders: Have concrete prompts to count your blessings. A magnet or sign, a daily alarm when it’s time to complete your gratitude journal, or an accountability partner would help you to remember to be grateful until it becomes a habit. Use positive language: Your language choices are strong indicators of your outlook. Grateful language includes liberal use of words like “gifts, givers, blessings, blessed, fortunate, [and] abundance” (p. 204). The words you use can frame the situation for you – if you discuss things like they are gifts, you will eventually start seeing them as such. Go through the motions: In other words, fake it ’til you feel it. Research has shown that when the smile muscles are engaged, people’s brains tell them that they are feeling happy. This is true with gratitude, as well. Even if you are not feeling particularly grateful, try saying “Thanks” – write a note, make a phone call, Facebook it if you have to. Chances are, it will make the recipient’s day, and make you feel more grateful over time. I want to pass this life of gratitude on to the Little Hippie and Baby Hippie, both by modeling the behavior and by helping them to be thankful with each passing day. After reading this book, I know that counting our blessings during evening prayers might need to be augmented by having a written journal. I think that having a place where Little Hippie records drawings of the things that bring her joy will also provide a source of solace when times are rough. In short, it was a decent read with some interesting facts and helpful tips. I won’t be running out to buy my own copy, but if you would like to learn more about the science behind gratitude or read a bit more about the tips for cultivating it, you may want to pick up this book at the Library. Focus on Chapter 7 if you are short on time. This entry was posted in Reading Room (other media, too) by The Reluctant Hippie. Bookmark the permalink.